In the previous lab (The Troposphere), you explored multiple aspects of the troposphere, which is the lowest layer of the atmosphere and thus the one in which you live. That lab ended with a time and space examination of aerosols (i.e., particulates). What was not noted in The Troposphere is that some particulates are air pollutants, which are substances that adversely affect ecosystems and the health of humans. Air pollution is a major problem across the globe, with 4.2 million deaths per year due to exposure to ambient (outdoor) air pollution. In this lab, you will learn about particulates and other forms of air pollution, including ozone, which you have previously examined in Lab 2 (Stratospheric Ozone). You also will examine changes in air pollution over time in the United States as well as real-time pollution levels across the globe. How does atmospheric circulation affect air pollution? How and why have pollution levels in the United States changed over the past several decades? In what types of countries do you find the highest PM2.5 concentrations and why? The first pollutant we will examine is particulates. As noted earlier, the previous lab ended with this topic. Particulates range in diameter from 10 nanometers (to put this in perspective, a human hair is around 50,000 nanometers) to 10 micrometers (to put this in perspective, 1 micrometer is equal to 1000 nanometers). The reason we care about where actual particulates fall in this size range is that we are constantly breathing in the particulates. Particulates that are larger are generally filtered in the nose and throat and do not cause problems, but those that are 2.5 micrometers or smaller – labeled as PM2.5 (for Particulate Matter, 2.5 micrometers) — can settle in the bronchi and lungs and cause health problems. The effects of inhaling particulate matter have been widely studied in humans and animals and include asthma, lung cancer, cardiovascular issues, and premature death. Fossil-fuel combustion is a major source of small particulates. Below is a simulation of the movement of various types of aerosols (i.e., particulates) from 17 August 2006 to 10 April 2007. The colors of the plumes correspond to the type of aerosols: red is mineral dust, green is aerosols from biomass burning, white is aerosols primarily from the burning of coal, and blue is sea salt. Without people on the planet, there would still be sea salt, wind-blown dust (e.g., Saharan dust), and some biomass burning (from lightning strikes). Unfortunately, human activities have greatly increased the amount of wind-blown dust and biomass-derived aerosols, and they have introduced aerosols from coal-burning (e.g., sulfate aerosols) into the atmosphere. The smallest particulates, and thus the ones most dangerous to human health, shown below are the green particulates (organic and black carbon) and white particulates (sulfates). Q1: Notice the large amount of both dust and biomass-burning aerosols over and to the west of equatorial Africa being carried by the trade winds. Which of these two types of aerosols are probably more dangerous to the health of people living in equatorial Africa? Q2: What is the general movement of aerosols in the middle latitudes? Does it tend to be east to west or west to east? Q3: Besides sea salt, what appears to be the dominant aerosol in the middle latitudes (e.g., 30° to 65°) of the Northern Hemisphere? Q4: What is the most likely source of the high concentrations of sulfate aerosols over and downwind of eastern China? Not all the sulfate aerosols in the animation are derived from coal combustion. There was a giant plume of sulfate aerosols that began to appear off the eastern coast of Africa on 12 January 2007. These aerosols were released by the Karthala volcano on Grand Comore Island. You should have noticed that the aerosols emitted in the middle latitudes tended to travel from west to east. This is known as westerly flow, and it is the dominant air flow in the middle latitudes when one moves away from the Earth’s surface. For example, most clouds in the middle latitudes move west to east, as is shown in the animation below created with the Community Climate System Model (CCSM) and the National Center for Atmospheric Research (NCAR).. It has an hourly time step during a typical year. Cloud cover is shown in white and areas of precipitation are shown in orange. The month and hour are shown in the upper right of the animation. Finally, check out the image below showing wind flow in the middle troposphere over the USA during June 2005; the winds on this day are not much different than what normally happens over the United States and North Atlantic Ocean. You will notice that the winds away from the surface in the middle latitudes on this day and in general are typically westerly, which means they move from west to east. it might not be a perfectly straight route from west to east over the northern United States, but it is more west to east, than east to west (i.e., easterly), north to south (i.e., northerly), or south to north (i.e., southerly). Q5: What is the typical air flow thousands of feet above the surface in the middle latitudes and how does this affect the transport of pollutants? Let’s now take a look at ozone (O3). Ozone at or near the surface (i.e. ground-level O3) is produced by complex chemical reactions that involve nitrogen oxides (NOx), volatile organic compounds (VOCs), and ultra-violet radiation. Major sources of NOx are fossil-fuel combustion and biomass burning. Ozone cannot be produced without solar radiation, and emissions of VOCs and NOx typically increase with an increase in temperature; because of these factors, you typically hear about “ozone alert” days in the summer. Exposure to high O3 concentrations has been linked to increased hospital admissions for respiratory problems (e.g., asthma). People living in cities with high O3 levels have an increased risk of dying from lung disease. O3 also interferes with photosynthesis, which means it can lead to the reduced agricultural production and the death of forests. Finally, O3 in the troposphere is a greenhouse gas, and has thus contributed to the phenomenon of anthropogenic global warming. 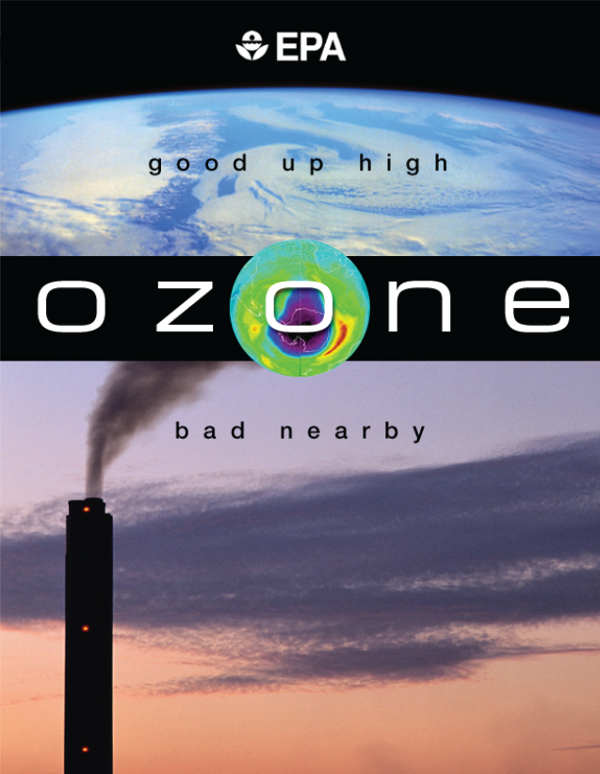 Therefore, ozone is “good” in the stratosphere and “bad” down at Earth’s surface (see image below). Click TroposphericOzone_2010 to view an animation in Google™ Earth that shows changes in O3 concentrations from month to month in 2010. This animation is very similar to the animation you viewed in the Stratospheric Ozone lab. The difference is that the animation in this lab is showing O3 concentrations (in ppb) in the troposphere, while the animation in the previous lab showed ozone concentrations (in Dobson Units) for the entire atmosphere. Tropospheric O3 data were measured by the Ozone Monitoring Instrument and the Microwave Limb Sounder on-board NASA’s Aura satellite. Q6: You should have noticed that there was a large swath of high concentrations of ozone in the Northern Hemisphere from May to September; why would the highest concentration occur during those months? Q7: Why are there high ozone concentrations over the North Atlantic Ocean during the summer, despite the lack of large NOx and VOC emissions from the ocean? Q8: Why are we focusing on high levels of ozone in the troposphere in this lab while in Lab 2 (Stratospheric Ozone) we focused on low concentrations of ozone in the stratosphere? Q9: During what months did you observe a large swath of high ozone concentrations in the Southern Hemisphere? Q10: How are the factors that contributed to high ozone concentrations in the Northern Hemisphere different than the factors that contributed to high ozone concentrations in the Southern Hemisphere? Hint: Think about the sources of the precursor chemicals. The Clean Air Act led to a major improvement in air quality in the United States. Initially, the act just supported research into what harmful effects could be clearly linked to the presence of certain pollutants in the atmosphere, and what levels of those pollutants represented reasonable risks. Then, in 1970, with clear results of that research in hand, politicians made decisions about regulating the levels of the pollutants. This legislation has been amended several times, with the last major amendment coming in 1990, when acid rain and ozone depletion were among the problems explicitly targeted. In this part of the lab, we are going to investigate the effects that this act had on emissions of gases and particulates and then look at how those effects were related to changes in such things as the acidity of rain in the United States. The first thing we will examine is changes in particulate emissions and concentrations for the entire country. Prior to 1987, total suspended particulates (TSP), was regulated; after the 1987 amendments to the Clean Air Act, PM10 (Particulate Matter, 10 micrometers or smaller), was regulated. 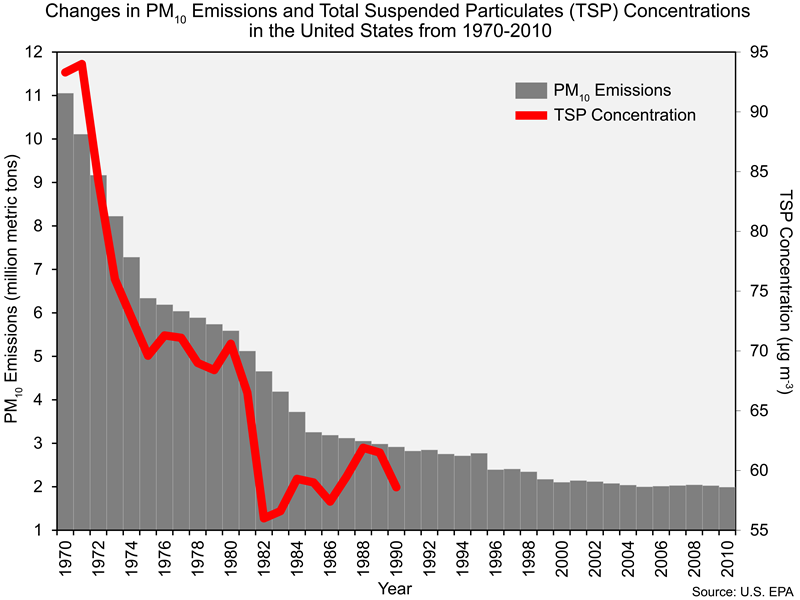 The graph on the left below presents the emissions of PM10 and the concentrations of TSP (values are averages from approximately reporting 1,000 sites) from 1970 – 2010; the pie chart on the right below presents the sources of PM10 in 1970 and 2010, which will help you understand what lead to the changes in the graph. Q11: Why do you think the level of PM10 emissions changed so rapidly in the first part of the graph above (left portion) and less rapidly in the remainder of the graph (right portion)? 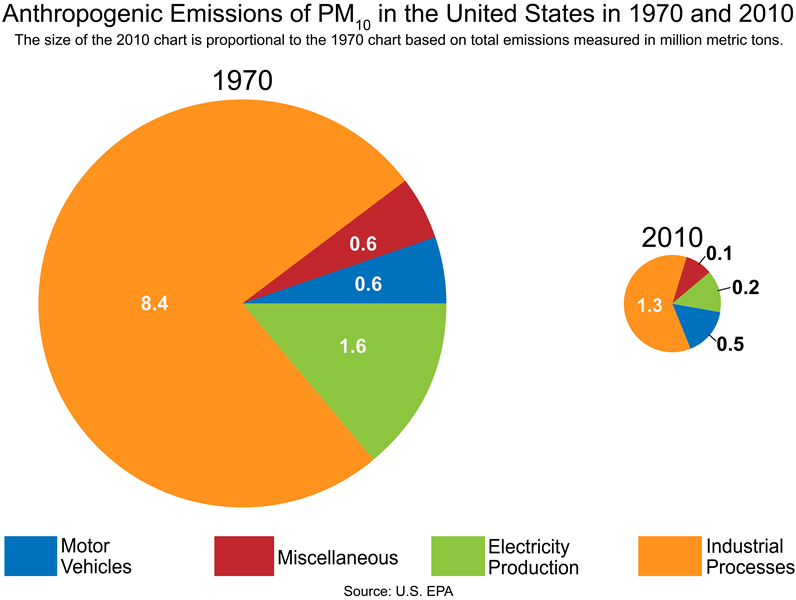 Q12: What source had the largest decrease in PM10 emissions from 1970 to 2010? By the way, the decrease in PM10 emissions most likely caused a rebound in summer rainfall in the Atlanta region. Next, let’s turn our attention to nitrogen oxides (NOx) and sulfur dioxide (SO2) which are produced when fossil fuels (gasoline, coal) containing traces of nitrogen and sulfur are burned. SO2 is also released in volcanic eruptions (such as the 1991 Mount Pinatubo eruption that was mentioned in Section 2 of this lab). 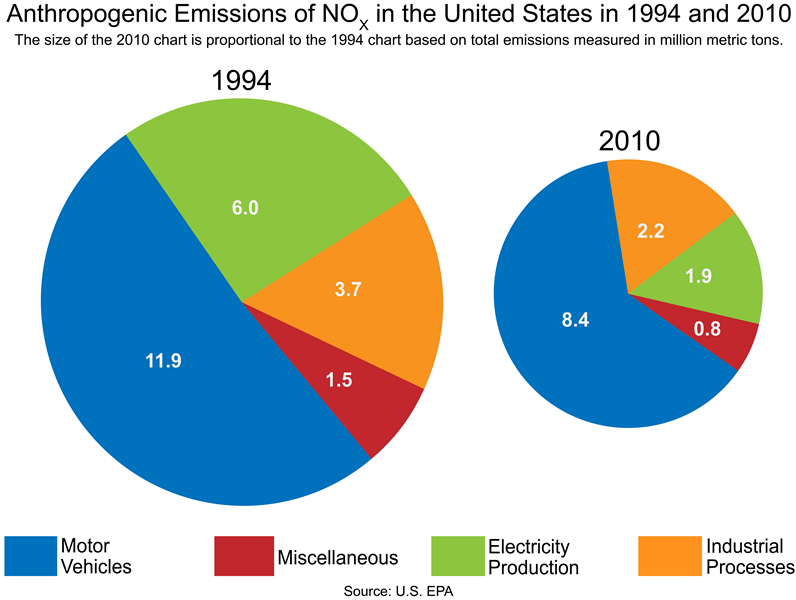 Below are images showing changes in NOx and SO2 emissions and concentrations for the United States. The NO2 concentrations are averages from 81 sites and the SO2 concentrations are averages from 121 sites across the country where those concentrations are monitored. 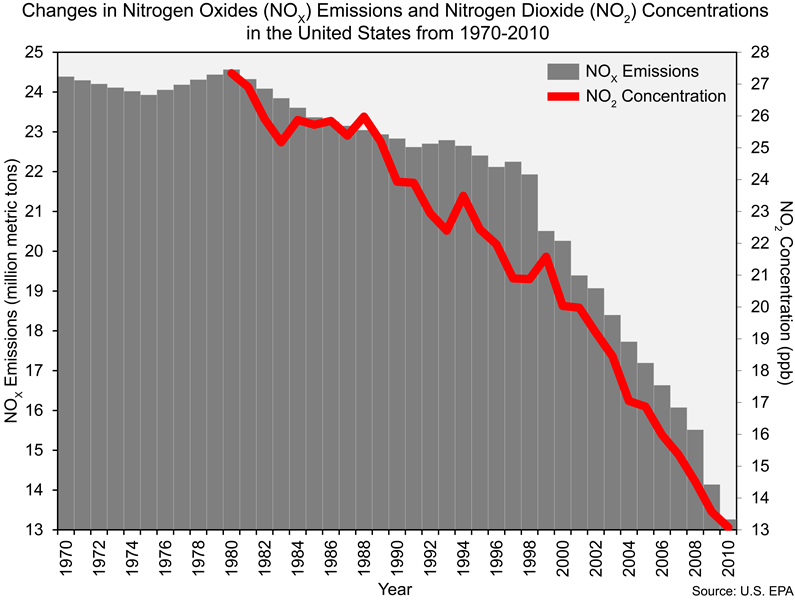 As you can see in the graphs, the Clean Air Act led to major reductions in NOx and SO2 emissions and thus large decreases in concentrations in NO2 and SO2. 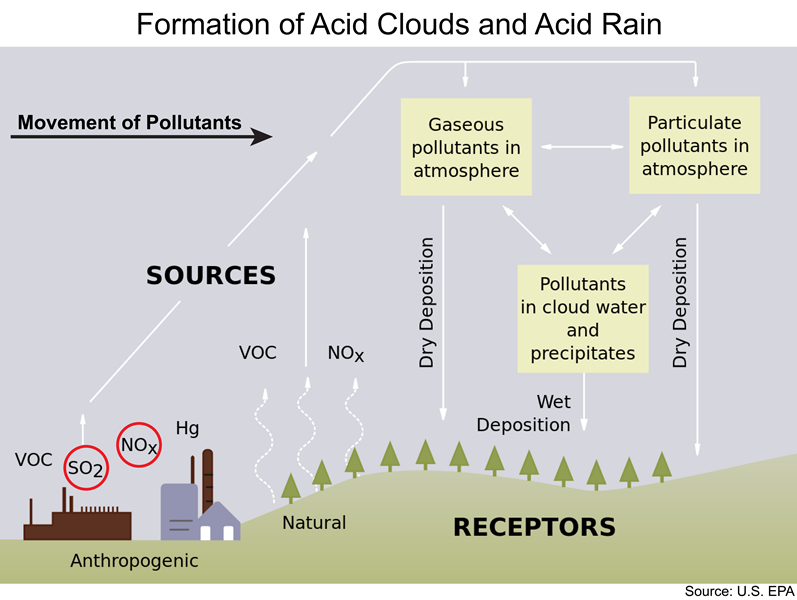 Acid rain is produced when there is an abundance of either SO2 or NOx or both in the atmosphere, as these gases react with water vapor in the atmosphere to make sulfuric acid and nitric acid. View the picture on the left below to visualize this process. 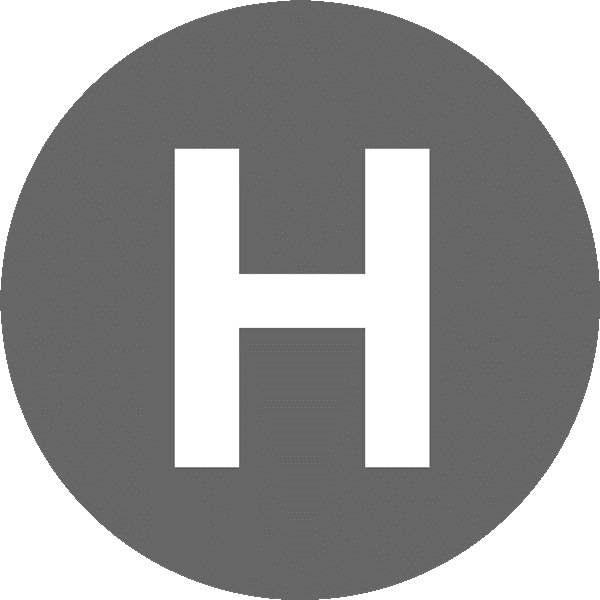 The pH (power of Hydrogen) scale can help us keep track of acid rain, but only if we understand two things about the scale. First, because the ‘p’ or ‘power’ part of ‘pH’ stands for the fact that these numbers are ‘power of 10’ values. This means that pH is a logarithmic scale, like the decibel scale for sound. What that tells us is that changing the pH value by 1 really means the level of acidity is changing by a factor of 10. 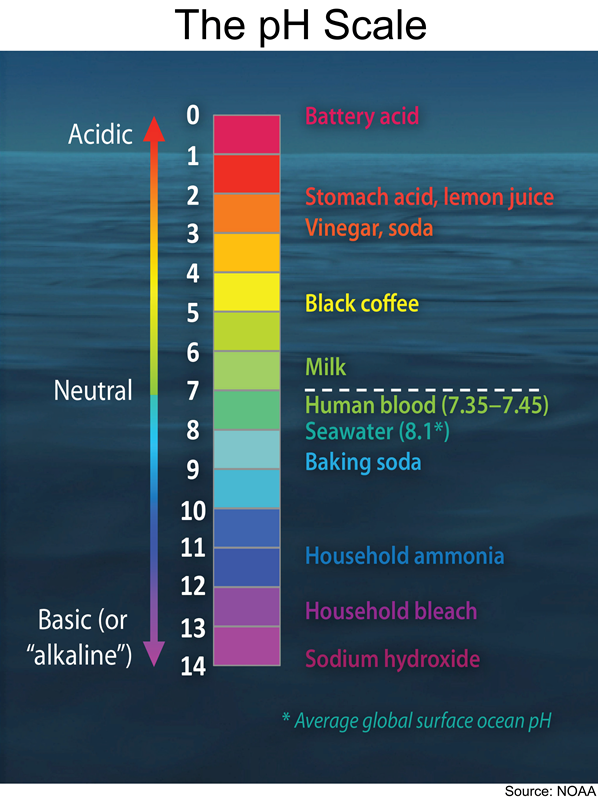 Second, because of how pH values are calculated, a smaller number on the pH scale means a higher acidity. So, putting those two things together, if the pH measurement at a particular place changes from 5 to 4, that should be interpreted as the acidity has increased 10 times. Look at the picture of the pH scale on the right below to become more familiar with the meaning of pH values. ‘Clean’ rain has a pH between 5 and 6, which means it is slightly acidic (that’s because of CO2 which is naturally in the air and forms carbonic acid). Electricity generation (e.g., coal-burning power plants) contributes SO2 and NOx to the air, causing the pH of the rain to decrease (i.e., making the rain more acidic). An interesting thing about Title IV of the 1990 Clean Air Act (which focused on acid rain) is that it penalized power companies for causing increases in the acidity of water within a certain radius of the plant. Acid rain can kill aquatic life forms and destroy forests. Acid rain has eliminated insect life and some fish species, including the brook trout in some lakes, and streams in geographically sensitive areas, such as the Adirondack Mountains of the United States. Some high-altitude forests are often shrouded in acid clouds and fog; as a result, entire sections of forests have died. As you learned earlier in the lab, pollutants get transported by the prevailing winds, which are mostly westerlies (i.e., west to east winds) in the middle latitudes. Therefore, the Adirondack Mountains and other remote places in the eastern United States typically receive SO2 and NOx – the main ingredients for acid rain – from places to the west. Now you are going to look at a Google™ Earth file that was created to show the changes in pH in different parts of the country from 1985 to 2012. Click on pH_1985-2014 to view this animation. Be sure to move the left-side tab on the time slider all the way to the right before starting the animation. 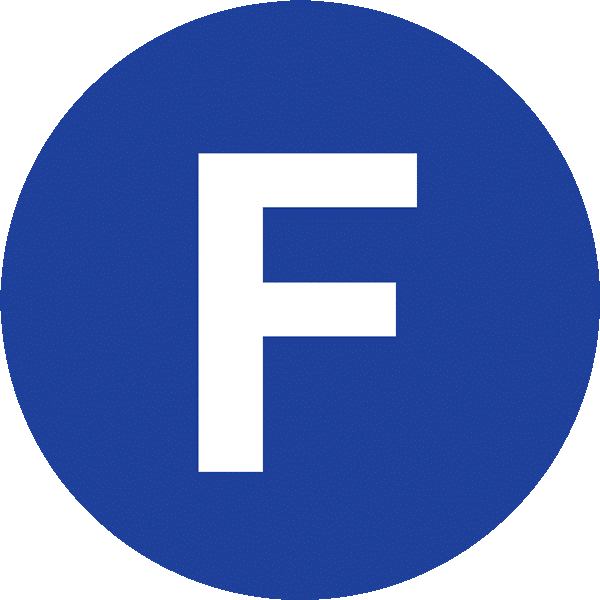 If you do not, then the 2014 image will be the only that is shown. Q13: What was the general trend from 1985 to 2014 in the size of the area with pH levels less than or equal to 4.5 (below which the environment is considered to be acidic)? Q14: Across that entire time range, in what part of the country are the pH values the lowest? In what part of the country are the pH values the highest? You can open pH_Change to see changes from the mid-1980s to the present in the pH of precipitation. Keep in mind that an increase in pH of one or so represents a 10x decrease in acidity … that is a huge reduction of acid rain! Q15: What region of the country (western, southern, midwestern/northeastern) had the biggest improvement in acid rain? So the Google™ Earth files have shown you that there has been a major improvement in the acidity of precipitation over the past 30 years, but knowing that begs the question, ‘What caused that change?’ There are two pie charts below designed to help answer that question. 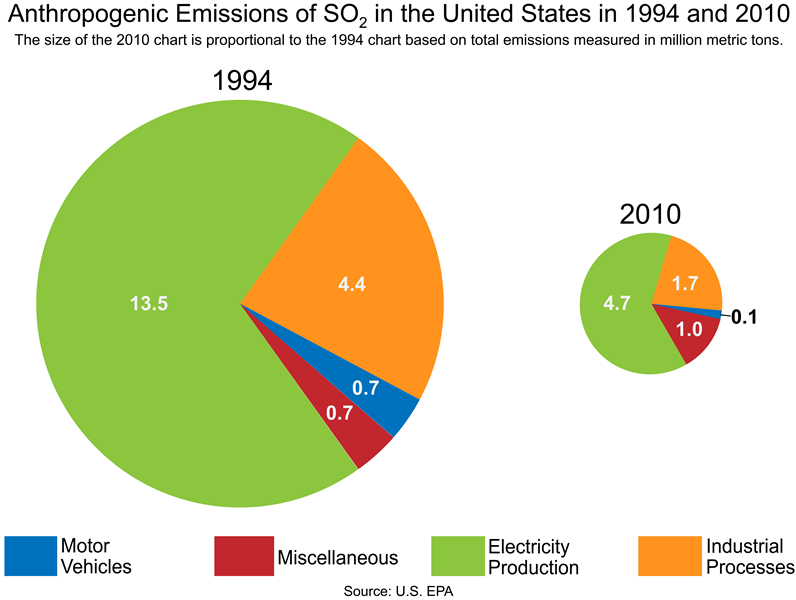 The charts show the change in total nitrogen oxide (NOx) and sulfur dioxide (SO2) emissions from 1994 to 2010 through the size of the pies. They also show the change in the percentage of emissions from different sources between those two years. Use the charts to answer Q15 below. 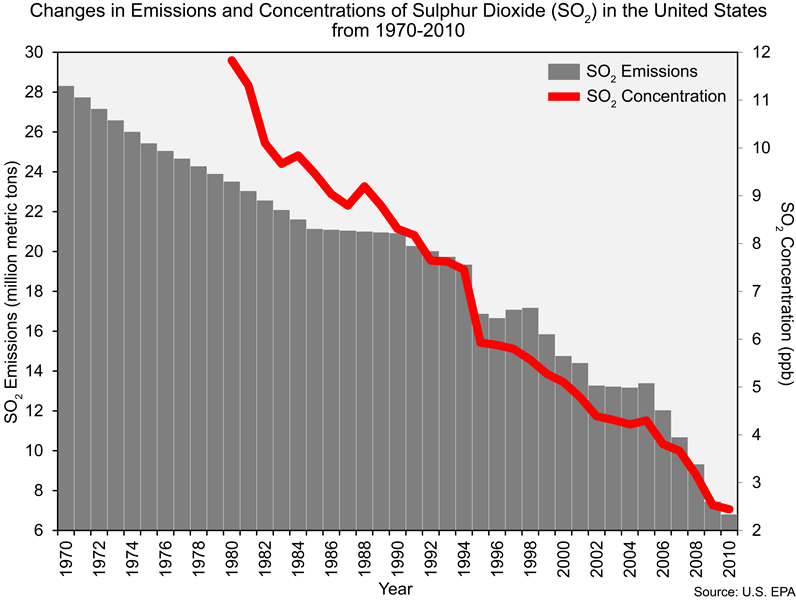 Q16: What source of NOx and SO2 emissions was reduced the most between 1994 and 2010 and, as a result, helped to raise the pH level (i.e., decrease the acidity) of rain in the United States? • Open the SO2_Emissions_Facilities. 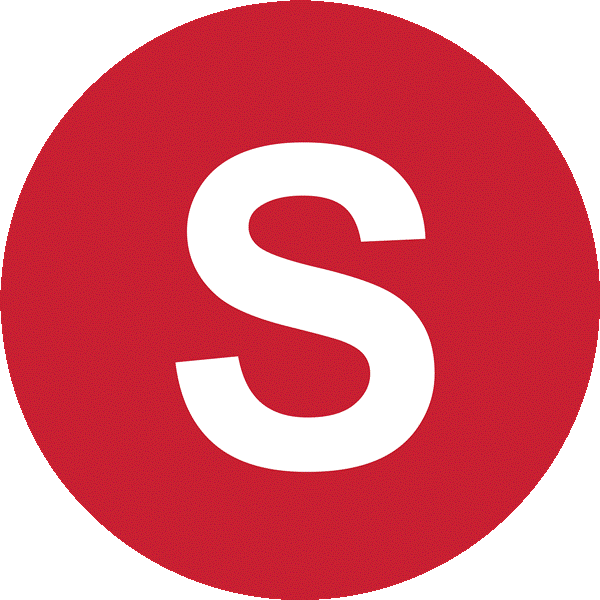 The size of a red circle is proportional to the emissions of SO2 from a facility. Q17: What region of the country has the highest concentration of SO2 emitters? • Zoom in on 3 – 4 of the larger red circles to get a closer look at the main emitters of SO2 found in that region. Q18: What did you learn about these emitters (e.g., their identity, the structure of the facility, etc.) by zooming in on them? • Open the NOx_Emissions_Facilities. The size of a yellow circle is proportional to the emissions of NOx from a facility. The red circles for the SO2 emitters should still be present. Q19: How does the region of highest concentration of NOx emitters compare to the region of highest concentration of SO2 emitters? Why do you think this is the case? Q20: In Q13 you identified the parts of the country with the lowest and highest pH values. How does the information in these two Google™ Earth files explain which parts of the country have the lowest and highest values? 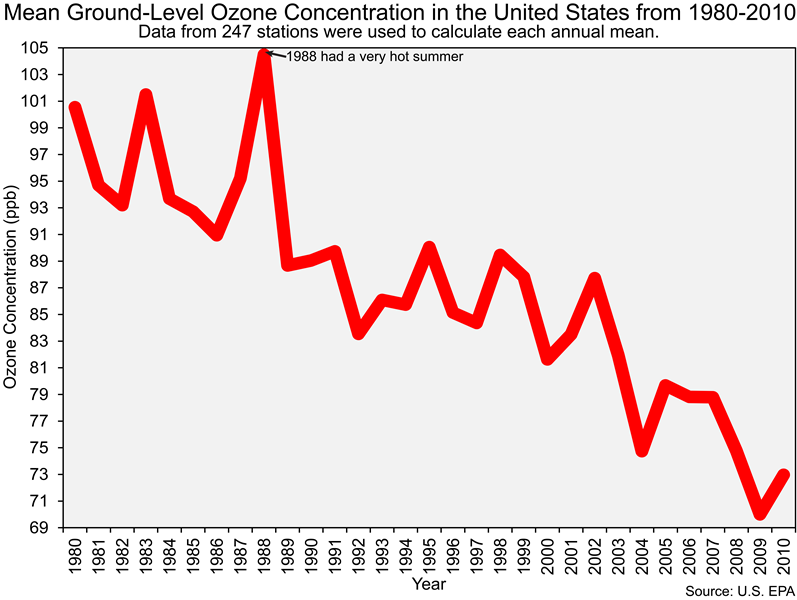 And before we end this section of the lab it is important that you also know that the Clean Air Act led to dramatic reductions in ground-level ozone concentrations in the United States, as you can see in the figure below. Q21: The reduction of emissions of what chemicals (e.g., pollutants) led to the decrease in ozone concentrations shown in the figure above? Unfortunately, most of the world has not experienced the dramatic improvement in air quality that the United States has experienced over the past several decades. In many countries, air quality has gotten worse. Presented below is the Air Quality Real-time Map from Berkeley Earth. This map provides near real-time information on concentrations of particulate matter less than 2.5 microns in diameter (PM2.5). PM2.5 is much more damaging to humans than is PM10. Grey areas do not have PM2.5 data, and this includes nearly all of Africa. Examine air quality today and the six preceding days, and feel free to zoom in and out of the map. Q22: Name two countries that have unhealthy concentrations of PM2.5? What do you think are the major causes of those high PM2.5 concentrations? Q23: You most likely didn’t find unhealthy concentrations of PM2.5 in the United States. Why is this? If you are doing this lab in a month other than July, August, or September, then you most likely found unhealthy PM2.5 concentrations in India. Data from the World Health Organization show that 11 of the 12 cities with the highest PM2.5 concentrations in the world are in India. Other developing countries (i.e., low- and middle-income countries) with high PM2.5 concentrations include Cameroon, Pakistan, Uganda, and Bangladesh. The one thing all these areas share in common is widespread biomass burning. Besides the usual sources of air pollution in urban areas such as fossil-fuel combustion and road dust, much of the air pollution in northern India and in those other developing countries comes from biomass burning. People burn wood and dung for cooking and heating and the burning of crop stubble (i.e., the part of the crop that was not harvested) is widespread. Download this file and open it in Google Earth. The nine cities with India with the highest PM2.5 concentrations in the world are denoted by the red circles. Q24: Where in India are the cities with the highest PM2.5 concentrations? As you just saw, the most polluted cities in India are in the northern part of the country. 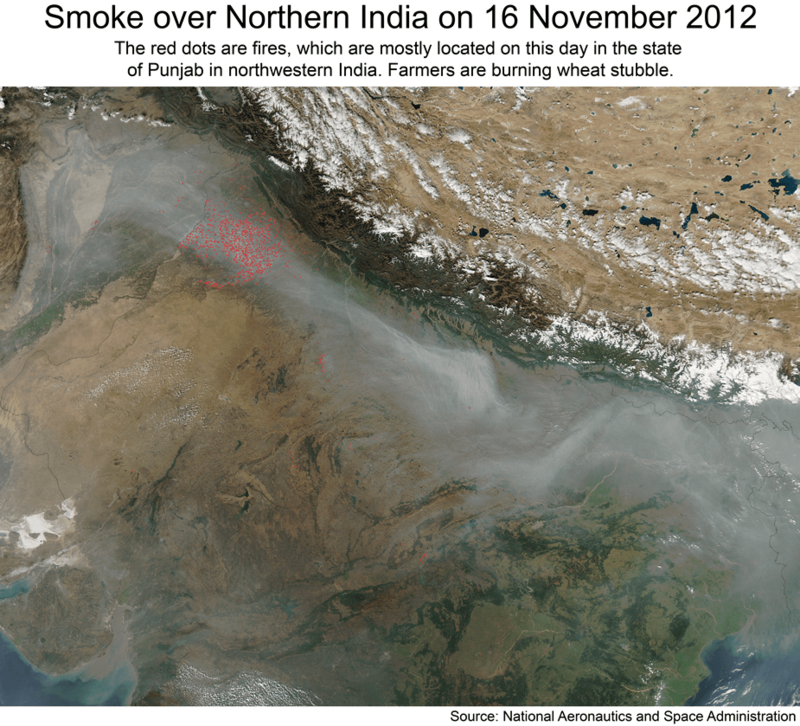 And as you can see from the image below, the entire region can be blanked by smoke from the burning of crop stubble. Now watch the animation below of month-to-month changes in aerosol optical depth. You watched this animation at the of the previous lab (The Troposphere). Q25: How would you describe the general magnitude of aerosol optical depth (i.e., PM2.5 concentrations) and month-to-month changes in aerosol optical depth over northern India? Ignore the months with no data, which is indicated by grey. Now revisit the simulation below of the movement of various types of aerosols from 17 August 2006 to 10 April 2007. Focus on India, and remember that the red aerosols are wind-blown dust, the green aerosols are derived from biomass burning, and the white aerosols are derived from fossil-fuel combustion, especially the burning of coal. Q26: What are the likely major sources of the high concentrations of PM2.5 over northern India?